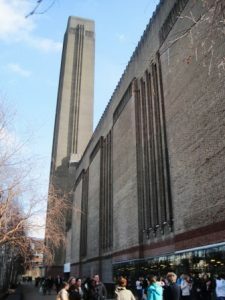 Tate Modern is London’s new modern art gallery displaying modern and contemporary art from 1900 to the current day. It occupies the converted brick clad Bankside power station on the south bank of the River Thames and opposite St Pauls’s cathedral. The river can be crossed at this point by pedestrians via the infamous wobbly Millennium Bridge. The main entrance to the gallery is from Holland Street to the west and leads down a wide ramp straight into the vast Turbine Hall which has a floor area of 3,400 square metres and occupies the entire depth and height of the building to form a cavernous space which is used for temporary exhibitions. Level 1 – West Entrance, Information Desk, Cloakroom, Turbine Hall (large temporary exhibitions). Level 2 – North Entrance, small exhibitions by contemporary artists and typically running for two to three months. Level 3 – Material Gestures exhibition covers abstraction, expressionism and abstract expressionism with artists including Monet and Matisse. Poetry and Dream on the same level focuses on surrealism and artists include Yves Tangny and Max Ernst. Level 4 – Set aside for large temporary exhibitions. Level 5 – Energy and Process exhibition featuring arte povera – revolutionary art of the 1960s, and States of Flux which displays cubism, futurism, vorticism and pop art with works by artists including Roy Lichtenstein, Pablo Picasso and Andy Warhol. Tate Modern is open every day and entry is free, but charges apply to some special exhibitions. *The route from St Pauls is included even though it takes more than 10 minutes, this is because it is such a lovely route over the Millenium Bridge.